Purchasing home appliances is a major decision for most homebuyers and represents a significant investment. Big ticket items like a washing machine, dishwasher, refrigerator or oven can pay off with increased efficiency, energy savings and a long lifespan – but a poor decision can lead to buyer’s remorse and too many repair bills. Where do smart shoppers purchase home appliances? Here is a look at the best places to buy appliances and the inside info you need to know about each. We’ve looked at selection, service, price and more to help you understand your buying options and make the right choice for your next major home appliance. The home improvement giant is one of the leading retailers for major appliance purchases, thanks to a simple shopping experience, in-store or online, combined with abundant product selections. With thousands of stores nationwide, it’s easy for most people to stop into a local store to check out the available products. The product selection is typically excellent, with Home Depot carrying everything from budget-friendly machines to more sophisticated, smart-home-enabled options. Be on the lookout for extra savings with the retailer’s “Special Buy” promotion, which heavily discounts select models. As an example, this well-loved HE 4.7 cubic feet washing machine from Maytag gives you a generously sized wash drum, a sanitizer cycle, a rapid wash option and digital controls for more than 30 percent off. If you’re more of an online shopper, you can peruse the many categories of appliances and will find the website to be easy to navigate, with all the features and specs clearly laid out with bold numbers and eye-catching graphics. Comparison charts make it easy to compare similar items and find the best combination of price, features, ratings and other criteria. Home Depot also offers a great price-match program. For online purchases, they’ll match an advertised price plus shipping costs. If you’re shopping in-store, they offer a 10-percent low price guarantee–meaning they’ll beat any advertised price for an in-stock item by 10 percent. However, be aware that wholesale clubs like Costco are excluded from the price-match program. Delivery and installation terms are easy to understand and reasonably priced. Delivery is free with any new appliance purchase totaling $396 or more. The delivery team will also hook up your new machine (excluding dishwashers and some gas appliances – these may incur an additional fee). If you want your old appliance hauled away – and who doesn’t? – you’ll just need to tack on an additional $15 to make it disappear. If you’re shopping for major appliances and have a Lowe’s near you, this is another popular in-store option to make your purchasing decision. Lowe’s carries all the major players in the kitchen and laundry departments and is known for having helpful and friendly employees to answer customer questions. You can push, pull, open and close the dishwashers, dryers, washing machines, refrigerators and more before picking out the unit you want to buy. All the major players in the appliance game are well-represented, including Whirlpool, GE, Maytag, Samsung, LG and more. Universally appealing and fairly priced appliances are easily found, like this stainless steel GE 25.4-cu ft side-by-side refrigerator with ice maker. The online shopping experience is adequate. If you know the make and model that you’re looking to buy, it is straightforward enough. But each product page lacks the bold features and specs that some other competitors offer, and there is no handy comparison chart to help you understand the differences between various makes and models. If you’re a comparison shopper or undecided on several options, you may enjoy the online format of some other sites better. As a plus, Lowe’s will price-match local competitors – including membership-based warehouse clubs like Costco and Sam’s Club, if there is a nearby store. However, they don’t go the extra mile like Home Depot and offer a 10-percent low price guarantee, so if you’re shopping around for the lowest bottom dollar, factor this in. Once you’ve picked your appliances, Lowe's offers something that most other major appliance sellers don’t: next day delivery. It’s free on purchases of $396 or more. As is the case with most delivery services, they’ll deliver, unbox and hook up your freestanding range, refrigerator, washer, or electric dryer for free. And if you want your old appliance taken away, there is a $20 charge. Known as the tech superstore, Best Buy also carries a respectable selection of major home appliances. The assortment includes basic refrigerators, dishwashers and more that will get the job done, along with more advanced smart-home-ready options. If you’re looking for the latest and greatest in home appliance technology, Best Buy is a good place to start your shopping. Whether you shop in-store or online, you’ll have plenty of knowledge at your fingertips to make the right decision. Best Buy prides itself on helping you find the newest technology for your home, so its no surprise that shopping categories include “smart” appliances and feature items like the Samsung 5.8 Cu. Ft. Gas Flex Duo Smart Range with Convection in stainless steel. This range allows you to control both the cooktop and oven remotely via an app on your smartphone. Like some of the other leading appliance retailers, Best Buy runs frequent promotions on their appliances, along with special appliance packages. The chain offers free delivery on appliance purchases of $399 and up as well as new installation and haul-away of old appliances for an additional fee. Costco might already be your go-to spot for sampling bite-size appetizers as you stock up on pantry essentials, but the members-only store also sells major appliances with attractive benefits. One of the top benefits of buying your next dishwasher, range or refrigerator from Costco is the optional extended warranty. 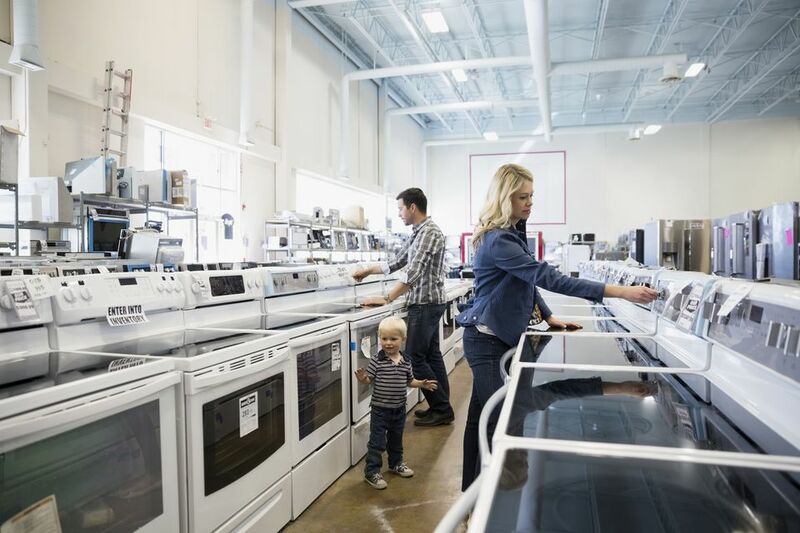 Purchase a major appliance at Costco and they will extend the manufacturer’s warranty to two years for extra peace of mind – and potential repair savings down the road. Additionally, you’ll also have free technical support if you’re having trouble figuring out a feature or function on your new machine. Costco also offers free in-home delivery and basic setup of new appliances – while promising to haul away the old ones. This can easily run you several hundred dollars with some other retailers, so factor this savings into your shopping plans. If you don’t already have a Costco membership, however, you will need to sign up for one to purchase most of the major appliances, since only a very slim selection is available for non-member purchase. This Internet retail giant isn’t just for buying the latest gadgets or scoring a great deal on a recurring order of paper towels – they also carry a growing selection of major home appliances. Amazon's selection is not as robust as those at some of the brick-and-mortar stores, and some of the big brand names are conspicuously missing from the available products – like Samsung, GE and Whirlpool. However, popular products from Frigidaire and Kenmore are often found at competitive prices. For instance, the sleek Kenmore 73025 French Door Refrigerator in fingerprint-resistant stainless steel is available on the site with included delivery and installation for almost $300 less than the advertised price at Sears. Additionally, if you’re looking for harder-to-find European or gourmet models of appliances, then Amazon may be your best bet. 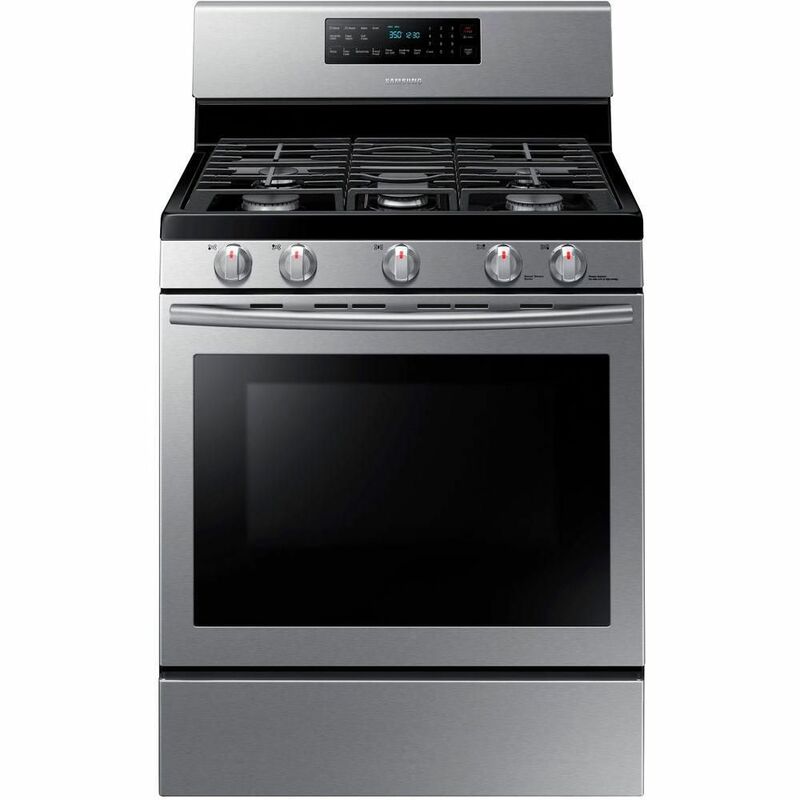 One home-chef favorite is the Thor HRG3080U Freestanding Gas Range. This four-burner range is paired with a convection oven with an interior finish of eye-catching blue porcelain enamel. If online shopping is your thing, it can't hurt to take a look for appliance deals on Amazon. It may not be a one-stop shop, but it can land you a great price on your next washer or a much-coveted gourmet range. Just be sure to pay attention to the delivery terms, since these can vary by brand and seller. Priding themselves on offering an "unrivaled selection," AJ Madison is a great place to pick up appliances from more than 150 brands—including FiveStar, Frigidaire, GE, LG, Maytag, Samsung, Smeg, Viking, and Whirlpool. Though their only location is their showroom in Brooklyn, NY, they ship anywhere in the continental U.S. For large appliances, they offer standard delivery, white-glove delivery, or in-home delivery. It typically takes one to two weeks from the time of purchase to receive your order and they offer appliance installation in New York, New Jersey, and Pennsylvania, but note that it is through a third party and may require an additional charge. If you enjoy shopping from the comfort of your couch, AJ Madison is a solid bet. An added bonus: their Rebate Center will help you score great deals on appliances from your favorite brands.